Energy drinks, coffee and green tea are at first sight different beverages. Despite the different color, smell and taste, however, they have one thing in common. Caffeine - alkaloid, without which many people can not imagine the beginning of a new day. We tell how beverages with caffeine affect the body. Coffee is a very popular drink. Caffeine contained in it can stimulate, help concentrate and suppress fatigue. It increases blood pressure, but it benefits to a reasonable extent. It is reported that approximately 400 mg of caffeine per day is the maximum dose that affects the body positively. Imagine two espresso of quality coffee. Some studies describe that regular drinking of this drink reduces the risk of heart and vessel disease. If you do not quench coffee and prefer green tea, you can indulge in up to 4 cups a day. Studies indicate that tea users are not exposed to an increased risk of cardiovascular disease and coronary artery disease. Some even claim that green tea has a protective effect on blood vessels. Saying the final verdict of how badly energy drinks sign up for our health is difficult. It can not be judged whether or not the body is harming it. And no matter what energy drink we are assessing. Both the composition and the amount of substance in the individual beverages are almost the same. However, the rate of onset of action may be faster than coffee. This is due, among other things, to the high content of simple sugars, which are already absorbed in the mouth. And sugar is considered to be one of the main engines for many processes in the body. In itself, it has an encouraging effect. 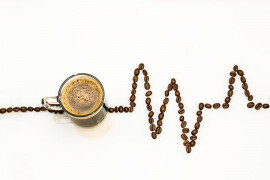 Caffeine generally raises blood pressure, both systolic and diastolic. It also increases the heart rate, some people describe at higher doses of heart pounding. This is because the heartrooms work faster than the chambers. This condition is transient, and after the treatment of caffeine, the heartbeat returns back to the standard. In sensitive people, caffeine can cause nervousness. Do you think you're helping your health by abstinence? The study, which assessed the effect of alcohol on the onset of cardiovascular disease, came with the following conclusion: Alcohol helps to increase the level of good HDL cholesterol and reduces the risk of diabetes. It can be said that a pint of beer or two grams of wine per day are really healthy.